It’s been a while since I found the time to update the blog, so my apologies for the lack of posts over the last few weeks. Finally this weekend I had the opportunity to do some cooking and amongst the recipes that I tried were these two. 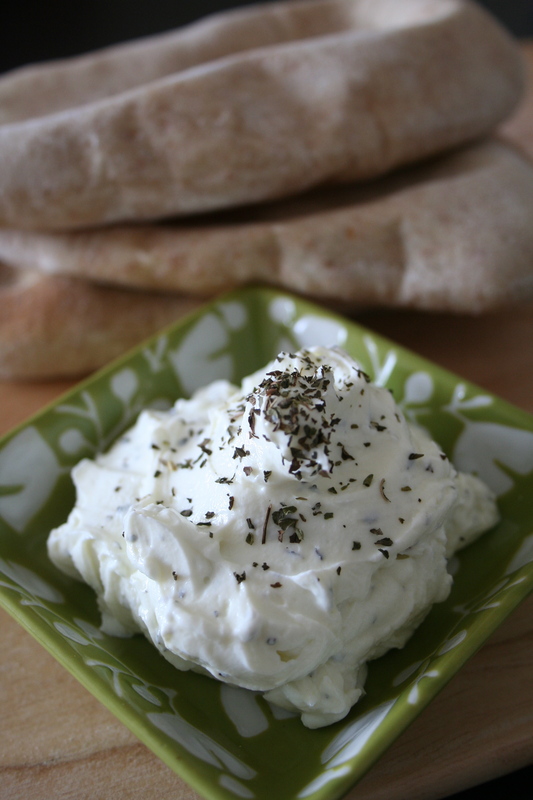 I spotted this recipe for labneh on Tomayto Tomahto a little while ago. 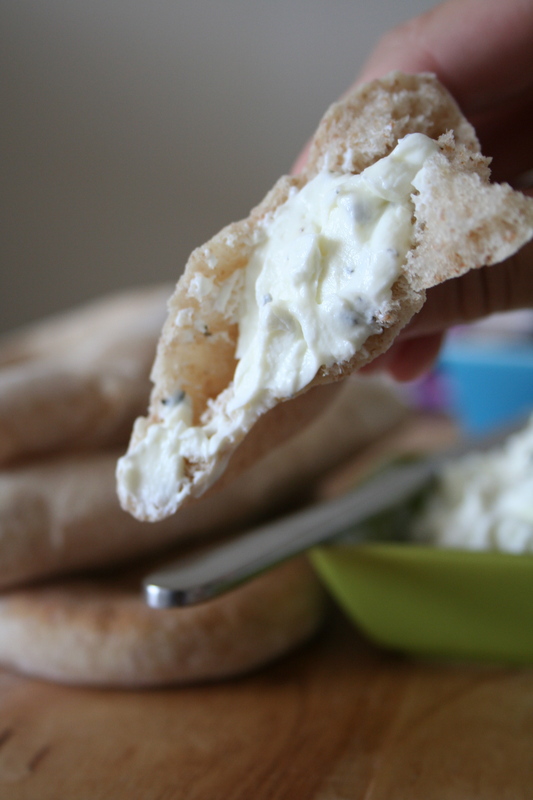 Labneh is a sort of cream cheese made in the Middle East – it’s simply made from strained yoghurt and can be flavoured in a variety of ways. It is often sprinkled with za’atar – a spice blend including sesame seeds and wild thyme but the possibilities for flavouring are endless. I’ve even come across some sweetened versions of labneh with honey and ginger. For my own, I simply added a sprinkling of dried mint, a little salt for flavour and a little olive oil to help it keep longer. This is a good option for calorie-counters as (like mine) it can be made with fat-free yoghurt and flavoured however you like. It should keep for a week or two, so it’s a good lunchbox option if you fancy a change from boring old sandwiches (as I frequently do). 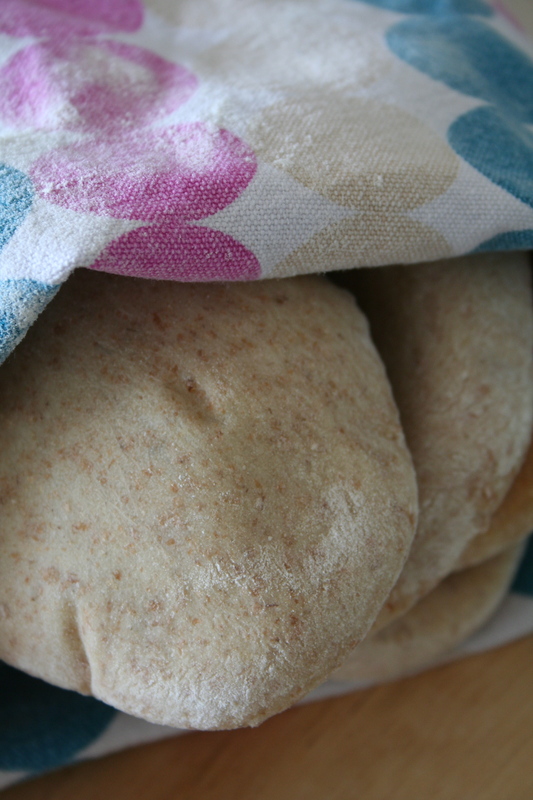 Having tasted these delicious pitta breads on my last visit home, I decided it was time to have a go at making my own. These were very straightforward to make and tasted infinitely better than shop-bought pitta bread, I’d highly recommend trying these. 1. Mix the flours and salt together, then mix in the sugar and yeast. Make a well and add the oil and water. Bring together the ingredients to form a moist dough. Knead for about 10 minutes, until it is smooth and elastic. 2. Place the dough in a lightly oiled bowl and cover. Leave to rise for about an hour – the dough should have doubled in size. 3. Knock the dough back and divide in 8-10 balls. Cover and leave to rest for 10 minutes. 4. On a lightly floured surface, roll each ball into an oval shape until the dough is about 1/4 inch thick. Place each oval onto a lightly floured tea towel and sprinkle with a little more flour. Cover the dough with another tea towel and leave to rise for 30 minutes. 5. Whilst the dough is rising, preheat the oven to 230°C/450°F and place two or three baking sheets in the oven to warm. 7. Remove from the oven and cool on a wire rack for a few minutes, then wrap in a tea towel to keep warm. 8. Eat them while they’re fresh! ~ by smileysoyabean on 17 June 2012.